For more information about this event, please contact Green Room Stories at hello@greenroomstories.com. Green Room Stories is thrilled to announce our first live event in Montreal! 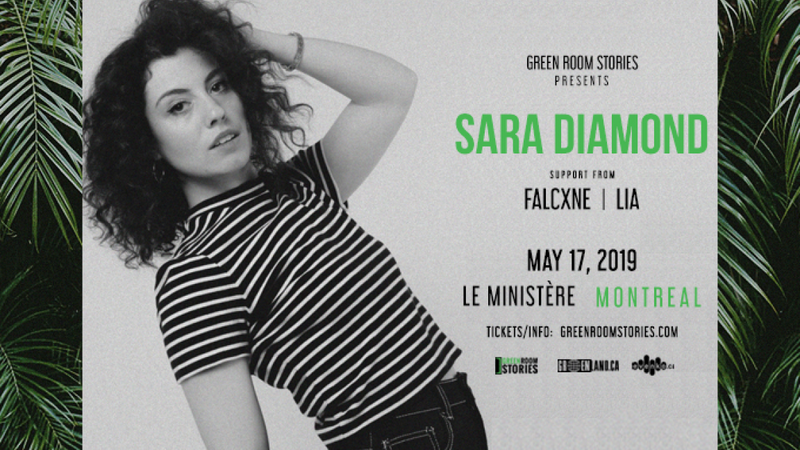 Join us at The Ministry on May 17th featuring a headline set by Sara Diamond with support from falcxne and LIA! Montreal’s Sara Diamond was granted the gift of song through her family lineage. Starting her professional career at just five years old, Sara’s years of exploration led to the development of a profound faith in the healing power of music. Sara’s smooth, smoky, and emotive vocals combine the best elements of R&B, soul, and pop to form her own breakthrough sound. Sara’s vocals are soothing like India Arie, captivating like Joni Mitchell, and seductive like Nina Simone. Her poetically introspective lyricism and creative expression powerfully recreate the human experience. Her vulnerable and honest music has captured the attention of renowned outlets such as Billboard, NYLON, Noisey, and Ted Talks as well as placements in Spotify’s Viral Top 50. Already garnering millions of digital streams, Sara strives to inspire listeners to believe that by accepting the beauty of who we are as individuals, we can learn to love each other without judgment and fear. Hailing from Montreal/Toronto, falcxne is one of Canada's top musician-turned-producer-turned-artists. Earning his laurels playing jazz piano and guitar gigs in university, he took the SoundCloud scene by storm when his first official release ended up on Australian star Ta-Ku’s magnum opus, the ‘Drive Slow, Homie’ series. falcxne has since gone on to release 5 full-lengths and a slew of singles, all of which have garnered international attention - including the 3 part ‘Timbits’ lo-fi series. His expansive list of collaborators includes Soulection’s J.Robb, Naji and Ta-Ku, Robotaki, Flamingosis, and many more.